not given credit to the architects that created the Art Deco design that is so admired. The Engineering principles are truly great but they neglect who did the conceptual design. A rendering in that book by “Michele” shows 5 lanes of traffic on the upper deck and 4 more on a lower deck. Is there any thought of building the lower deck ? I went back to my source, an article in the Fourth Quarter, 1999 Issue of MARQUEE magazine, titled “America’s First Art Deco Theatre,” by Steve Levin. It is about the San Mateo Theatre. 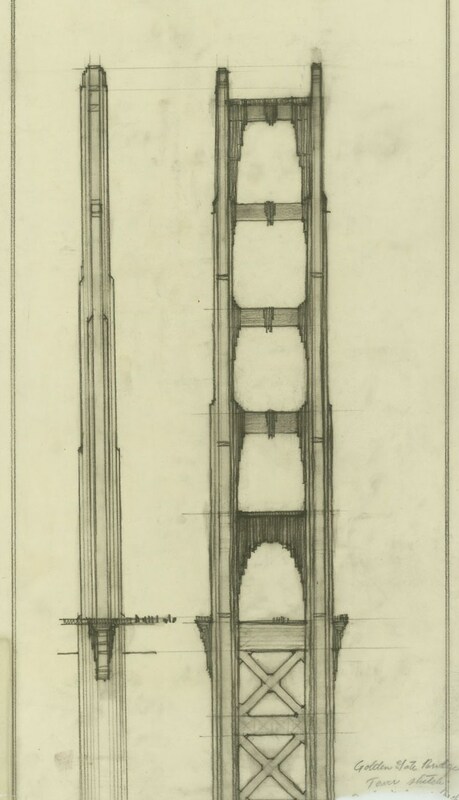 Unfortunately, all he says about the Bridge is, “Morrow was the consulting architect for the Golden Gate Bridge, and is generally acknowledged (along with his wife Gertrude C. Morrow, also an architect) as being the party most responsible for the extraordinary beauty of this great structure. The Morrows are unequivocally given credit for having selected ‘international orange’ for its color.” It would seem Steve Levin was unaware of Eberson’s contribution. Steve was an Eberson fan, of this I know, and had he known about that architect’s involvement, would have mentioned it at some point–certainly in the above-quoted text, aimed at theatre historians. I did find an online listing of female American architects that gives Gertrude Morrow’s lifespan as “c. 1892-1987.” Not a bad run! In Steve’s article on the San Mateo Theatre, he quotes an article by William Morrow in THE ARCHITECT AND ENGINEER (December, 1925) in which a Mr. S. Pelenc is credited with designing the wall hangings and proscenium mural for the San Mateo’s auditorium, all of which, according to photos taken at the time, are what we would today call Art Deco. However, despite much Spanish Baroque ornamentation throughout the interior and exterior of the theatre, it is clear in Morrow’s article that he was wanting to go Modern with the building as well, as he was not a fan of historicist pastiche, for the most part–especially furred plaster with no function. The auditorium ceiling was made almost solely of bare wooden planks laid between the chevron-arranged exposed ceiling beams and trusses, a truly innovative approach for the day. The large pendant lighting fixtures, which look to have been paneled in mica, are of a severe geometric design. Much of the wall surface in the auditorium was simply the bare structural concrete, with decorative paint applied in some spots, and plain color elsewhere. Steve also includes a photo of one corner of the Portal/West Portal (now CineArts Empire), showing the Right organ grille, adorned with Spanish style shields. Aside from these elements, and a scrolled pediment over the exit door under the organ chamber, the rest of the surfaces are adorned only in paint, and that sparingly. The walls appear to be plain cast concrete, with the imprints of the forms visible, and the ceiling is smooth plaster. There is some minimal Spanish styled stencil work along the tops of the walls, but that’s it. Decades later, Steve’s father, Ben Levin, hired Heinsbergen to come and do a decorative remodeling of the theatre, by then renamed Empire. The organ grilles were covered over in smooth plaster, pierced only by ventilation grilles–ductwork having replaced the organ pipes. The vents were surrounded by little painted Greek temple designs. Years ago, when looking at the photo, I quipped to Steve that you could call these Temples of the Winds. This term ended up in a later article Steve wrote about his family’s theatre chain. The Heinsbergen murals continued up the sidewalls, with more Grecian landscape scenery, with cypress trees and other foliage and more Greek architectural motifs. Presumably, these murals still exist behind the current fabric wall coverings. Steve said when his family remodeled the theatre prior to selling it in 1970, that is what was done. The triplexing was carried out by subsequent owners. i originally thought NOT to view the (so-many) exhibits that will be popping up like spring flowers everywhere, but after your well-written and researched article, i feel compelled to see and enjoy it all! thanks so much for the inspiration!!! Thanks for the nice comments, yes def recommend the CHS show! Are you back in SF? Wonderful coverage! It’s great to see Eberson’s contributions to the Bridge recognized so fully in print. It may be also mentioned that Irving Morrow (with William Garren) designed two theatres: the San Mateo, in downtown San Mateo, arguably the first movie palace in the US to embody any elements of Art Deco, and the Portal, in San Francisco. The San Mateo still stands as an office and retail building with most elements of its Mediterranean eclectic facade intact, and the Portal (later called West Portal, then Empire, and now CineArts Empire) still functions as a triplex movie theatre, albeit with a completely remodeled interior. Most of its exterior design is intact. 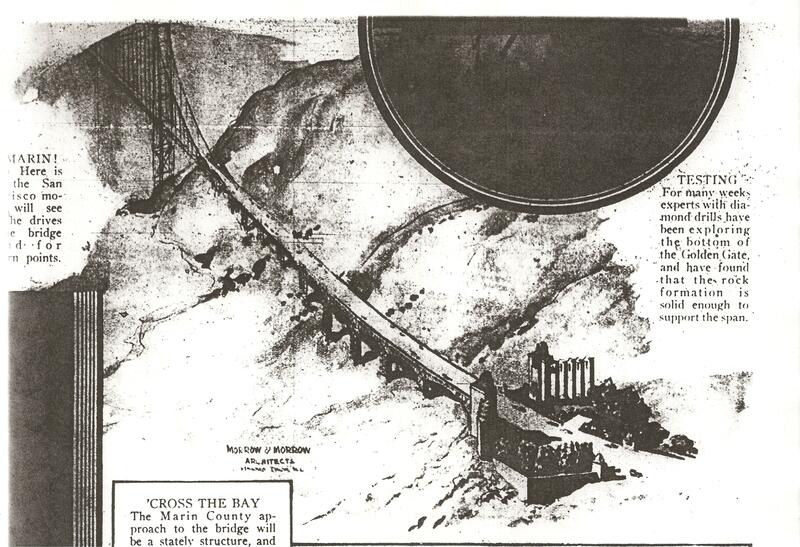 Also, the role of Irving Morrow’s wife, Gertrude, in the Golden Gate Bridge design should not be overlooked. Hi Gary. 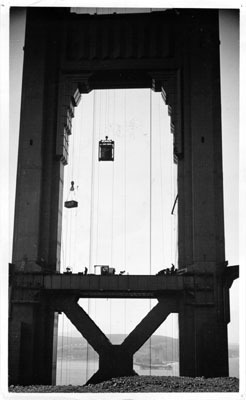 If you know much about Gertrude Morrow’s contribution to the bridge, feel free to expound when you have time. That would be awesome. I believe there was a mention in the CHS exhibit that says her contribution to the bridge was unclear (I would have to double check but that is what I thought I read?). Also very cool to know that Irving Morrow designed the theatre that is now called the CineArts in West Portal.